While running the 5k for Race for the Cure this morning in Schenley Park, I paused to take a photo of the Neill log house in Schenley Park. The Neill log house stands out and is hard to miss, mostly because a little house on the prairie style house surrounded by chain link fence in the middle of a gold course. Two weeks ago I wrote about the John Woods House, which is considered to be the second oldest house in the city of Pittsburgh. The Neill house is considered to be the first. Photo of Catahecassa Springs Monument from May 14, 2017. What I ended up photographing was the monument in front of the Neill house, something that I had never noticed before. Today was the 25th anniversary of the Race for the Cure and given the number of pink ribbon t-shirts in my drawer, I have certainly walked past this place at least a dozen times before. But this is the first time I noticed this stone monument. The entire nomination form for the Catahecassa Spring is available on the Preservation Pittsburgh website here. By the way, if you are looking for some extensive in-depth reading on local historic landmarks, the “Documents & Archives” section on the Preservation Pittsburgh website contains links to all of the recent nominations that they have submitted. 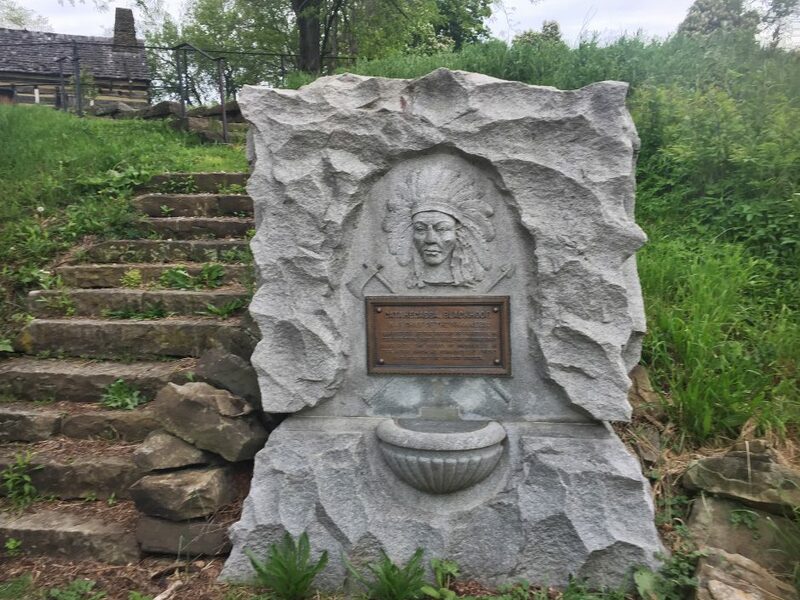 The Catahecassa Spring monument was built in 1906 to create a public water fountain at the existing Snyder Springs in Schenley Park. These fountains were used by visitors to the park. At some point the spigot was removed and catch basin filled in. Postcard of Catahecassa Fountain that was included in the nomination for historic designation. 1826 – Mary Elizabeth Croghan is born. 1845 – At the age of 15 Mary Elizabeth Croghan elopes with Captain Edward Schenley who is 43 years old. 1889 – Mary Schenley gives 300 acers to the City of Pittsburgh which will be developed into Schenley Park. 1890 – First reference to Snyder springs in Pittsburgh Daily Post article dated June 12, 1890. 1902 – Schenley Golf Course, now know as the Bob O’Connor Golf Course opens. 1906 – Sunday, September 23, the Pittsburgh Gazette Times Newspaper publishes article on the Catahecassa fountain that will be built at the Snyder Springs in Schenley park. (Nomination p. 58). 1985 – Schenley Park is added to the National Register of Historic Places. 1996 – Pittsburgh Parks Conservancy is founded to restore and protect Pittsburgh’s parks. 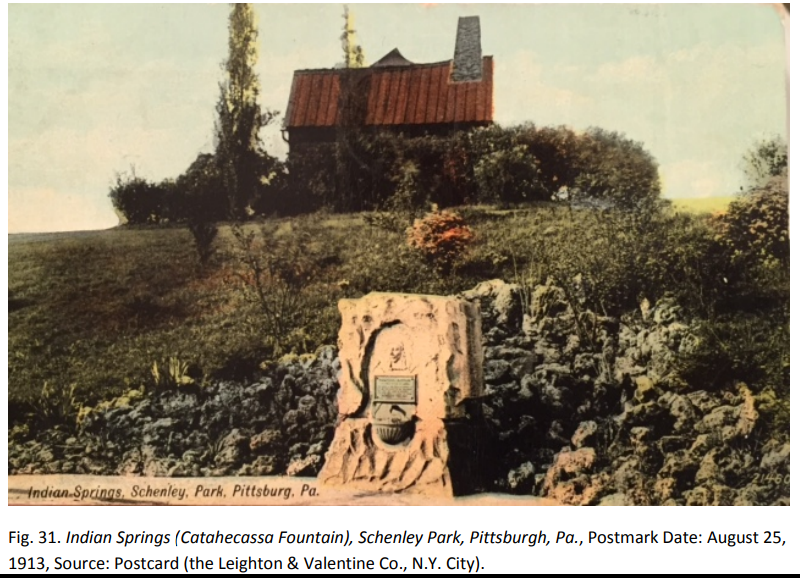 2017 – Pittsburgh City Council give historic designation to Catahecassa Springs. While Schenley Park is over 100 years old, it is interesting to see that many of the efforts to designate the park and monuments are only in the past 20-30 years. Have you seen a Pittsburgh monument that you would like to learn more about? Leave a comment below.